Not THAT kind of soy turkey. Thanksgiving is the ultimate Mash-Up holiday. It is our holiday. And on our holidays, we feast. This year, The Mash-Up Americans provide for you a complete holiday menu, including a Puerto Rican-inspired guava turkey with Mexican-infused jalapeño cornbread stuffing and Indian-spiced cilantro green beans. 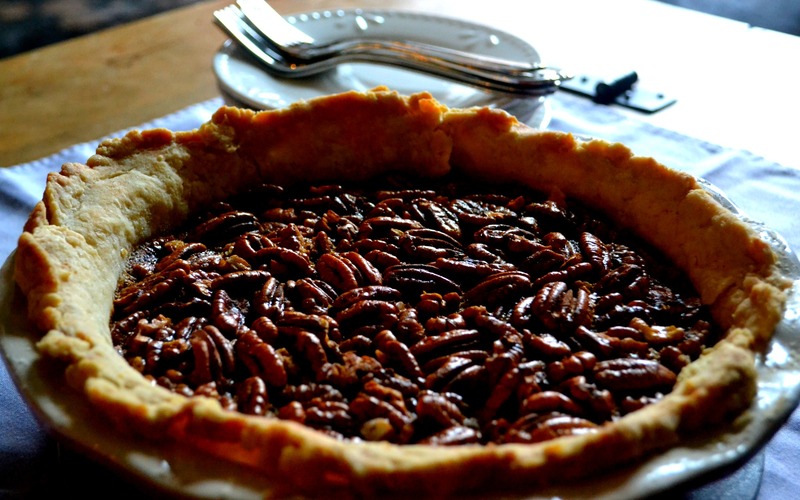 Save space for a straight-from-the-South bourbon pecan pie. Guava turkey not your jam? 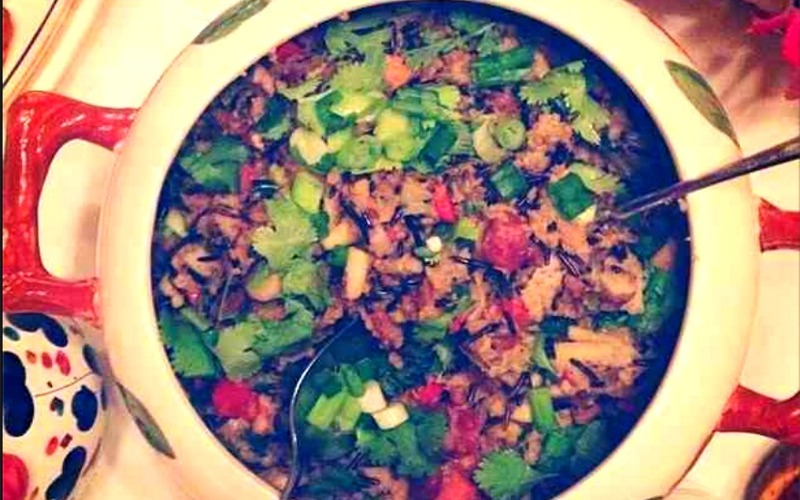 Try Paige Cowett‘s Chinatown-inspired soy-seasoned turkey, recipe below, with her sticky rice and Chinese sausage stuffing or a cornbread and Sriracha dressing. Eat on, Mash-Ups. Eat on. The idea that Thanksgiving turkey could be dry and disappointing is pretty foreign to me, because this butter-rubbed, butter-basted, soy and ginger-infused turkey is how my parents have made the turkey my entire life. 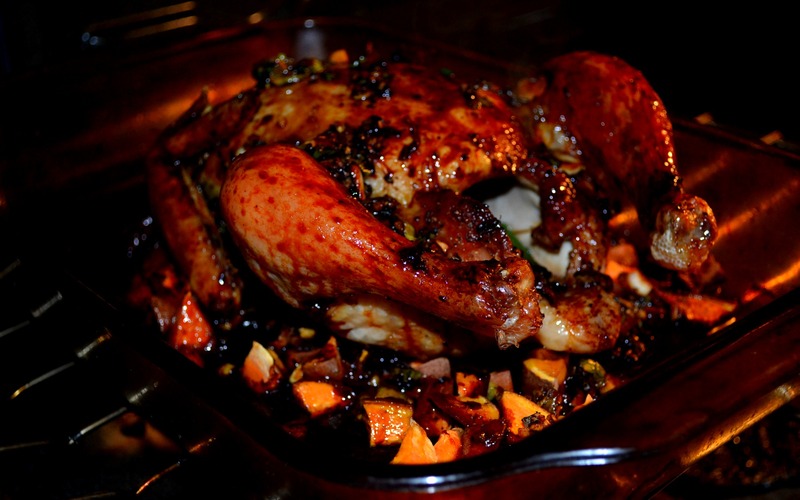 It has never failed to produce a super moist bird with crispy skin. It’s Chinese influenced in that it comes from my mom’s Chinatown-born parents, but it was actually my Anglo dad who mastered the recipe and liked to be in charge of it. This year for Thanksgiving, I’m in charge of the turkey. I’ll be making my dad’s marinade, and stuffing it with my Chinese sticky rice stuffing for my Jewish future in-laws. Butter, butter, soy. Butter, butter, soy. Butter, butter, soy. Preheat oven to 400°F. Wash and dry the turkey. Prepare the marinade by mixing all of the remaining ingredients in a large bowl, except for the butter. Baste the prepped turkey with the melted butter, and then baste with the soy marinade. Once this first basting is done, combine the soy marinade with the butter and keep hot on the stove. Roast the turkey at 400° for the first half hour, then reduce oven temperature to 325°, basting the turkey with the butter-soy marinade every 20-30 minutes until done (overall cook time depends on the size of your bird. 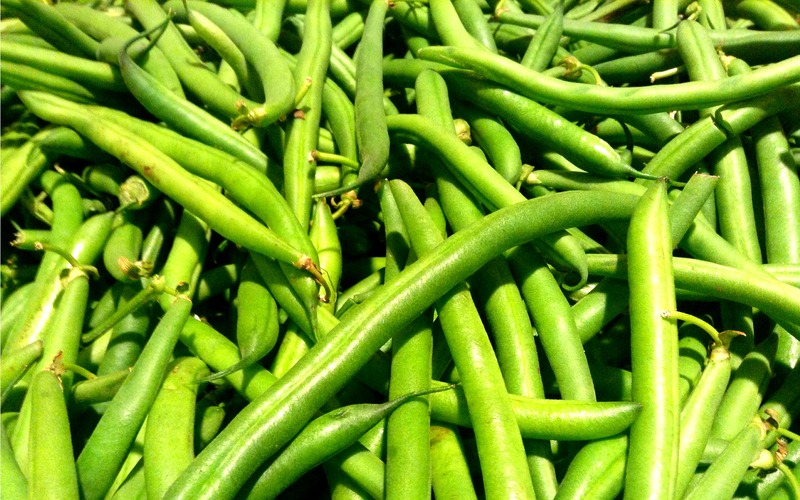 Plan for roughly 20 minutes per pound.) The skin should be pretty dark. It will also be delicious. Paige Cowett is a 4th-generation Californian and first-generation hapa. She has a graduate degree in urban planning, has worked in the arts and in Brooklyn politics, and now she's a producer/reporter at WNYC Radio covering health issues.